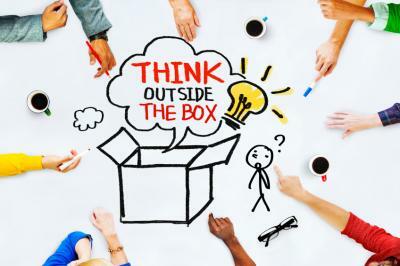 Think outside the box, is almost a clich?. The catch phrase encouraging us to be more creative is so common in America that one wonders as to where it started. Various consultants from the 60's and 70's claim to be the originator of that alleged magic formula. The discipline of management consultancy visualized the box as an intuitive symbol of mental rigidity. There are indeed, multiple authors of the catch phrase to "think outside the box". However, they harken back to the same point of reference: the specific box the na?ve common man tends to draw upon when trying to solve the popular 9 dots puzzle. The aim of that game is to connect the dots by drawing a straight and continuous line without lifting pencil from paper. Hint: Don't focus on the square box. Instead, try a lateral drawing approach. That way of thinking "outside the box" is no doubt the creative path that lawmakers followed when they reached into the banking industry once again as an ATM - this time to foot the bill for highway infrastructure renovation. Last summer, the US Senate approved a proposal intended to reduce annual dividend payments banks receive from the Fed. These monies could then be used to make necessary maintenance and construction of highways. As a political reward to the senators, they wouldn't have to focus taxpayer ire on the unpopular proposal of raising the gasoline tax. At the same time, they would be making a positive investment in crumbling infrastructure by "taxing" unpopular banks that the general public still generally associates with causing the financial meltdown. The game was that over 10Ys, senators would liberate $17B in dividends that they saw as unnecessary. After all, these dividends go back to the creation of the Federal Reserve System back in 1913. Lawmakers at that time decided to establish a board in Washington and 12 regional federal banks. To fund these Fed banks, they asked regular banks to become members of the Fed and to buy stock. The banks were prohibited from selling their stock or using them as collateral, but as compensation for tying up bank capital, the Fed agreed to pay them a 6% annual dividend. That's why last year the Central bank distributed $1.69B to 33% of the country's financial institutions. Bank of America pocketed $310mm, Citigroup got $250mm and community banks across the country got smaller dividend checks. Rather than fix the highways with highway related taxes, it seems Congress saw a "free" pot of gold sitting at banks. That is why earlier this month Congress voted to lower the dividend for banks with assets $10B+ (those below still get the dividend for now at least) from a fixed 6% rate to a variable rate equal to the 10Y Treasury yield (currently about 2.25%) and capped at 6%. This freed up money Congress could then use to pay for highway repairs and transportation projects. Maybe bankers should ask for signs along the road saying "This stretch of road was paid for by XYZ bank, so please come open an account." As could be expected, since larger banks are no longer getting a decent dividend, they are now lobbying to get their capital back from the Fed so they can invest it elsewhere. Today, banks that join the system have to buy Fed stock equal to 6% of the bank's capital and hold half of that (3%) at the Fed's regional reserve banks. Under the proposal, banks would only be required to hold 0.5% of their capital and the rest would be immediately returned to them. This number is estimated to be about $25B. This saga is still playing out, but it is interesting given the potential impact on the Fed, small banks, large banks, shareholders of banks and those driving the highways. At the very least we hope you can work it into discussions as you join family and friends for the holidays. There was a surge in Treasuries, dropping yields 10bps, as traders fled to safer investments. 1) BBCN Bank ($7.6B, CA) and Wilshire Bank ($4.7B, CA) will merge in a stock for stock merger of equals transaction. BBCN will get 9 directors and its shareholders will own 59% of the combined company and Wilshire will get 7 directors and own 41%. 2) First United Bank and Trust Co ($201mm, KY) will acquire Bank of Ohio County, Inc. ($95mm, KY) for an undisclosed sum. 3) Peoples Security Bank and Trust Co ($1.8B, PA) will acquire wealth management company Gilmartin Associates (PA) for an undisclosed sum. 4) Security Bank of the Ozarks ($47mm, MO) will acquire Community Bank ($50mm, MO) for an undisclosed sum. 5) Univest Bank and Trust Co ($2.8B, PA) will acquire Fox Chase Bank ($1.1B, PA) for about $244.3mm in cash (40%) and stock (60%). 6) BOKF ($30.3B, OK) will acquire Missouri Bank and Trust Co of Kansas City ($584mm, MO) for about $102mm in cash (100%). 7) Frandsen Bank & Trust ($1.5B, MN) will acquire Provincial Bank ($83mm, MN) for an undisclosed sum. The CEO of Wells Fargo said in a recent speech that he sees the wealth and investment management business as the biggest growth opportunity for the bank. Bloomberg reports online lending platform Prosper arranged the loan terrorists took out before their deadly shooting rampage killed 14 in San Bernardino, CA. Law enforcement, Congress and the CA Department of Business Oversight are all reportedly now investigating lending practices of online lending portals and their business models. A Market Force Information survey finds: 72% of consumers whose bank offers a mobile app have downloaded it vs. 65% last year. Meanwhile, by age grouping the survey found the following percentages: 18-24Ys (93%), 25-34Ys (84%), 35-44Ys (81%), 45-54Ys (72%), 55-64Ys (55%) and 65Ys or older (47%). Every category increased vs. the prior year. The Fed reports Americans lost $1.2T in wealth in Q3 due to a weak stock market. The decline is the largest in 4Ys.